Olympus is adding a new camera, the TG-4, to its Stylus Tough series. The new rugged compact is waterproof down to 50 feet, freezeproof down to 14 F degrees, crushproof up to 220 lb as well as dustproof. The TG-4 sports a 16MP CMOS sensor, TruePic VII processing engine, 4x optical zoom lens, and Wi-Fi/GPS connectivity. The TG-4 can record RAW images and has new Underwater HDR, Live Composite and two Custom shooting modes. The camera will come in red and black body colors in May and is currently available for pre-order for $379.99. 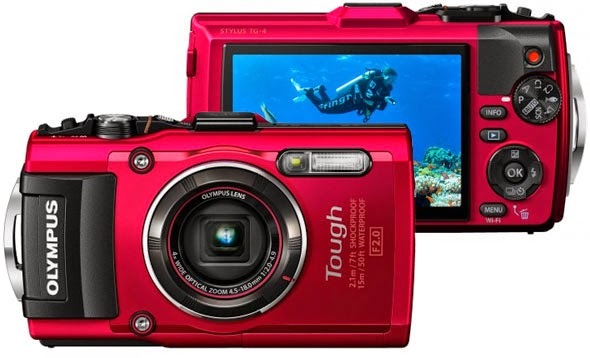 For the full list of compatible parts, please see Olympus Stylus Tough TG-4 accessories.